This page created 5th December 2001, updated 10th October 2002 by Ian Smith. Best on 800*600. In 1965 Southend Corporation Transport bought some very good-looking Leyland Titans. They were traditional half-cab Leyland Titan PD3s with good-looking 30ft rear-platform bodies by Massey, with seats for 70. The drive train was traditional, with a part-crash/part-synchro-mesh gearbox. 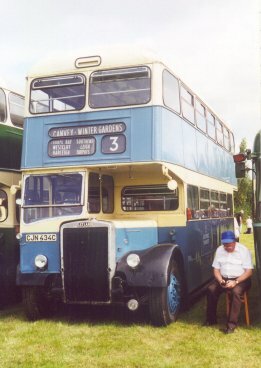 Southend added three more in 1978, with very similar bodies by East Lancs. In summer 1975 London Transport was suffering considerable bus-availability problems. The Merlin fleet had been side-lined, the Swifts and Fleetlines were suffering reliability and spares shortages, and even the RMs were suffering from the motor industry's chronic inability to supply spares. So London Transport took the unusual step of hiring in buses from Southend Corporation, for £15 per day. Their manual gearboxes required crew training before use. Ten were hired at a time, with maintenance by Southend, who rotated them. They went to Croydon (TC) for use on the suburban but strenuous route 190 between Thornton Heath, Croydon and Old Coulsdon, starting work in September 1975. They stayed, ten at a time, until February 1976, when London Transport's problems eased. 334 is one of the several survivors of the Southend PD3s. It is seen here at Lingfield Show in August 2000. Photo by Ian Smith. Click for larger version. London Country then seized upon the PD3s as a partial solution to ITS problems. Some were hired during 1976, from March onwards for use at Harlow (HA), where they were used mainly on long rural routes 339 and 397, but also occasional on the normally fare-box local routes (but with a conductor!). With Southend just down the road, maintenance was kept there, and the actual PD3s on hire altered frequently, maintaining the quota of ten on hire. London Country's problems eased as new Leyland Nationals arrived, and RMLs took over from the PD3s at Harlow from 28th January 1977.